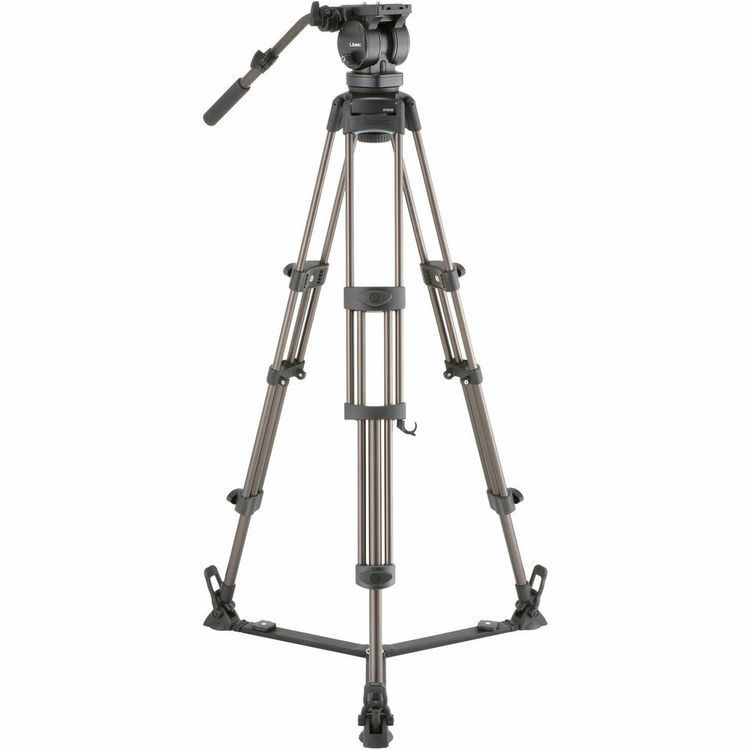 The Libec LX10 Two-Stage Aluminum Tripod System and H65B Head and Ground-Level Spreadersupports cameras and accessories weighing up to 11 pounds. The head and legs feature a 100mm ball/bowl, which provides a wide platform for stable shots. The legs are made from aluminum and feature three leg sections. The head and legs come with a ground-level spreader, and the system is height-adjustable from 25 to 68.5". To aid in leveling your shot, a bubble level is incorporated into the head. The head also features a sliding baseplate that allows you to adjust the balance of your camera. It provides fixed counterbalance that helps the fluid head support loads up to 35 pounds. With individual fluid drag adjustments for both pan and tilt, you can adjust the fluid head to suit your shooting style or the needs of the shot. The head features discreet pan and tilt locks, and the removable pan handle can be attached to either side of the head by via the built-in rosettes. The sliding balance plate features a total of four inches of balance adjustment, two inches forward and two inches back of center. This does not take into account the integrated balance slot that allows you to adjust the position of the captive camera tie-down screw. The head incorporates a small stud at the front that prevents the balance plate from sliding out. The included ground-level spreader prevents the tripod's legs from flying apart and is suitable for use on flat, level surfaces. Box Dimensions (LxWxH) 39.0 x 10.5 x 10.3"